Aliens invade Ireland, and the only way to stop them is to.. stay drunk. Clearly, it's based on the favorite Irish past time. Grabbers premiered at Sundance to positive reviews (Sundance review, EIFF review) and it will be getting it's theatrical release in the UK on August 10th. 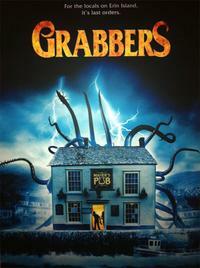 Grabbers is directed by Jon Wright, written by Kevin Lehane, and stars Richard Coyle, Ruth Bradley, Russell Tovey, and Bronagh Gallagher.